We were all ready for our break in Bukoba. The students were excited to do something new and leave their studies behind for a few days. Paul and I were happy knowing our budget would allow for some exciting adventures. We set out on our journey from Misha walking with our backpacks ready for adventure. After waiting for the Bunda bus to arrive in Kayanga, we boarded and were off to Bukoba. (I had bought the bus tickets beforehand, which were a mere 4,000 shillings or $2.35 per person each way) Some students from a nearby boarding secondary school called KARESECO entered the bus on the way and sat close to us. We struck up a conversation, and I asked a question which had puzzled our group for weeks, “Why did Tanzanians love Qaddafi?” Coming from a country that portrays Qaddafi as a ruthless, power-hungry dictator, we were surprised to find positive opinions of the man (along with negative opinions of America’s role in the attack on Libya) here in Tanzania. The students said Qaddafi took good care of his people, and asked where else in Africa could you find a leader who provided so much for his people? They also thought the majority of Libyans loved and wanted to keep Qaddafi, while only a minority was sick of him. The perception of American imperialism coupled with our country’s insatiable need for oil contributed to the students’ poor opinion of America’s foreign policy. We’re definitely reading different newspapers, and I’m still unsure as to who is most correct. We were coming close to Bukoba, and one of the students offered to accompany us to Spice Beach Hotel. I visited the hotel when I traveled to Bukoba for Paul and my residency permits, but I was unsure as to how to get there from the taxi park. Joseph agreed to help us, and once we arrived at the taxi park, we set off on foot to our home for the weekend. After a 15 minute walk, we arrived. The staff at Spice Beach Hotel was very welcoming and accommodating. Spice is located right on the sandy beach of Lake Victoria and has quaint tiki huts on the Sbeach where people gather to eat and drink while they listen to the waves. After eating a lunch of vegetable curry (delicious), we headed to a place called Kiroyera Tours to set up our adventures for the weekend. 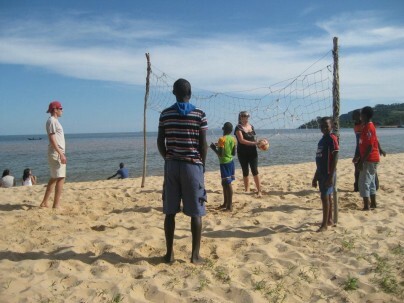 Our contact wasn’t there, and we ended up playing volleyball with a group of people on the beach. The next morning, Paul and I woke up early to visit our tour guide, Zaharan, and set up our tours for the weekend. Afterwards, we took our rented bikes around town and had a very good time watching the city wake up. We returned to Spice and our group was ready to set out at 10am. Zaharan arranged a motor boat for us to travel to the nearby island. On the way, we learned that people lived on the island and children attended kindergarten there, but had to come and live on the mainland once they progressed to standard 1 (elementary school). We were excited to see a Tanzanian population living an island lifestyle. We first boated around the island and saw a wide variety of birds (Paul was excited to see the African Fish Eagle), and holes which had been carved into the rock face near the water to bury local chiefs long ago. Once we landed, we signed the guest book, and began our trek up to the top of the island. We walked along a small trail surrounded by tall grass and other plant-life. Once on top, we walked around to look over the cliff’s edge which fell sharply down into the water 150 feet below. Zaharan told us dark stories of a girl accidently falling over the edge while she cut grass, and a man who committed suicide by jumping off. After scoping out the top of the hill, we began to descend and came to a very steep pass. 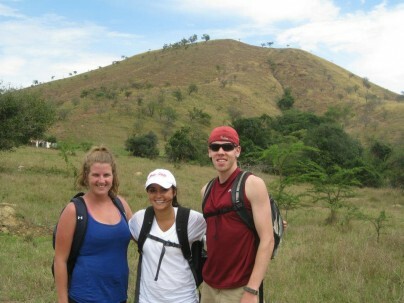 We descended the slope facing the mountain and holding on to rooted grasses to prevent us from falling. We walked through the front yard of a simple house, and children greeted us. One girl around the age of three looked ready to play so I picked her up and ended up carrying her all the way to our boat. I threw her up in air a dozen times and swung her around while she giggled with delight. I tried to put her down multiple times to which she said, “Bado! Tena!” (Not yet! Again!). I had a lot of fun. Carly and Isabel also played with children while we walked to our boat. Finally, it was time to depart, so we said “Kwa Herini” (Goodbye) and were off to the mainland. We ate a lunch of fried chicken and rice with avocado, and were ready to set out again. Zaharan took us to a wooded area with a forest floor covered in soft pine needles, which reminded Paul and I of Pennsylvania. There were tall pine trees and green ferns growing all over. I could heard a waterfall in the distance, but first we walked away from it and came upon a low hanging cave. The ceiling was very low and only at certain spots could a person stand up straight. We entered the cave and it was dark and moist. Zaharan guided us to the back of the cave and we saw dozens of bats hanging from the ceiling. It was a very cool experience. We shined our torches (flashlights) on the bats and their reflective eyes stared back at us. Every now and then we would feel the wind on our faces from a close flying bat. We took lots of pictures and Paul was pooped on. Zaharan then guided us to an exit different than the place we entered, and we had to crawl to get out. Paul got a sweet picture of me and the girls. Then we walked back through the forest and came upon a big, wide, stocky waterfall. Paul, of course, promptly began to jump rocks and swing on vines to cross the creek and get a closer look. I remembered jumping rocks to move closer to a waterfall in Costa Rica with Susquehanna’s SU CASA service-learning program, and remembered that once was enough. I found a rock to sit on where I could watch. The students followed Paul and Zaharan, and Sarah slipped into the creek and was wet up to her waist. I got lots of good pictures. After the waterfall, we drove for a long time over rugged dirt roads to go to a secret beach. After traversing about a hundred boulder-size holes in the road, we arrived at a white-sand beach where groups of men were slowly pulling in their fishing nets. Isabel walked far down the beach and did cartwheels with Zaharan’s younger sister, Sarah rested on the sand, and Paul and Carly and I watched/helped the fishermen. About five men had a system of walking to the water’s edge and pulling a rope which was attached to their net inland where one man was coiling the rope into stacks. Paul estimates that the rope was about 1,500 meters or one mile long. After watching Paul help the men pull in their net for 30 minutes, the net emerged and we pulled in their spoils. There were 15-20 medium sized fish and many small fish. The smaller fish were escaping through the holes in the net and I stood at the water’s edge to catch them and throw them up on the beach. Paul was offered one medium-sized fish after helping a man untangle it from the net. All of the fish were divided into equal piles and the men took their share. Afterwards, Paul and I approached the large herd of cattle that was grazing on the tough beach grass. It was a typical herd of brown and white cattle with horns of varying sizes. We moved toward a small cow, which allowed us to pet it. We returned to Spice Beach Hotel, ate dinner, and went to bed tired from the exciting day. Paul and I spent the night preparing our Photo Context Competition which we intended to give to the students in the morning. Joseph Miller, Amizade’s last Site Director for Tanzania, gave us the idea of the competition. Students venture out into Bukoba by themselves with a list of questions and the task to take a photo which encapsulates each prompt. I had prepared the questions before leaving for Bukoba, and was excited to send out the students. After breakfast and chai, I gave each student the assignment individually and sent them out on their own. After 3 hours, we gathered together at Spice and planned to show and judge their photos before dinner that night. We met Zaharan at 1pm and drove to visit and experience a traditional Haya village (The Haya is the local tribe around Bukoba). We arrived at a small, simple house and there were three women dancing to a drum and singing “Karibu Wageni” (Welcome Guests!). They continued to dance for a few minutes after we arrived, and then we were welcomed in to the house and sat on colorful weaved mats on the floor. Our hostess was a large woman wearing a Grumpy dwarf t-shirt and a kitenge wrapped around her. She passed around a bowl of roasted peanuts, which the students loved. Then we went to the backyard and took turns peeling green bananas and putting them in a pot on a wood fire to cook. After checking out a couple of pigs in their pens, we returned inside and prepared to eat. Our hostess brought six or seven banana tree leaves inside and placed them on the floor in the middle of the room. She then brought in a big pot full of food (cooked bananas like mashed potatoes, beans, beef, bitter tomatoes like squash) and flipped it to put the food on the banana leaves. There were many bowls around the leaves filled with side dishes like spinach with peanut sauce, bitter tomatoes with peanut sauce, cooked leaves of a cassava plant, Irish potatoes, yams, and a cooked fish in a kind of soup. We each took a plate and spoon, while our hostess and her helper ate with their hands in traditional fashion. We all loved the food. We continued our drumming and dancing after lunch and then took jerry cans and fetched water for the house. We walked for 3-4 minutes to a stream, filled our containers, and returned home trying to carrying the water on our heads. We felt accomplished once we arrived, and then started our drive back to town. Once we arrived back at Spice, we planned to shower and venture into town for dinner. Two of our bikes had been returned already, but there were still three of the big standard bikes left. I really wanted to bike because my right Achilles has been hurting me recently, and we all decided to go by bike. Isabel rode on the back of Paul’s bike, while Carly carried Sarah on her bike. The mile journey to the New Coffee Tree Hotel for dinner was comical to say the least. Carly “The Tank” Glancy insisted that she could carry Sarah and was eventually successful after navigating around small craters of water and lots of pedestrians. While we waited for our food, each student presented their photos and explained their reasoning behind them, while the rest of the group judged according to creativity, thoughtfulness, and personality. After tallying the points later, Carly was deemed the winner and received five fun-sized packs of M&Ms and a kitenge of her choice. Our food arrived just as we finished and we enjoyed fried chicken, goat, rice, and avocado. Paul and I walked the bikes back to Spice, while the students went to the disco to enjoy their last night in the city. The next morning Paul left to go on a run early, while I lounged around and played spider solitaire until breakfast time. After about 15 minutes, Paul burst back into the room hopping on one foot, saying he had re-sprained his ankle. He had fallen after placing his right foot on a fist-sized stone. So, Paul stayed at Spice while the students explored Bukoba and shopped for candy. We all met at the taxi park at 12:15pm and boarded the Bunda bus at 1:30pm. We arrived in Kayanga in record time (the bus driver was flying), and we had a warm welcome upon our return to Misha. Deo heard us arrive, and ran up and jumped onto Paul hugging him. Deo, Misha’s cook, calls Paul ‘kaka’ (brother) and me ‘shemeji’ (sister-in-law). 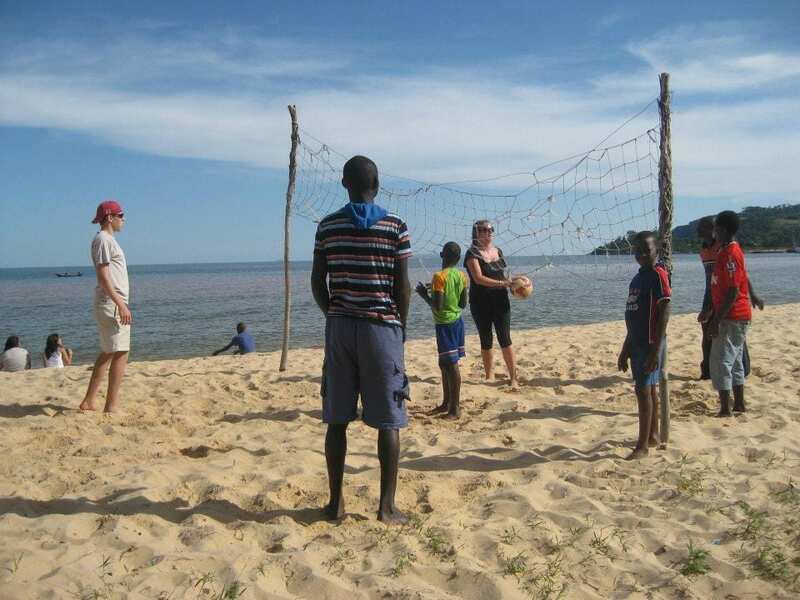 The students were happy to be back ‘home’ and felt that we had spent just the right amount of time in Bukoba. Now we are refreshed and ready to complete our time in Karagwe. Happy Halloween everyone! I’m missing one of my favorite holidays, but I’m enjoying the sun and 70-85 degree temperature. Thanks for all the details and such a vivid picture of your adventures.